Clothing that incorporates cars is always going to get our attention, not least because this striking item features the rally icon of the 20th century, the Audi Quattro. The Quattro smashed just about every rally stage in its career. With its four wheel drive and turbo engines, Audi made other car manufacturers look like they were driving backwards. 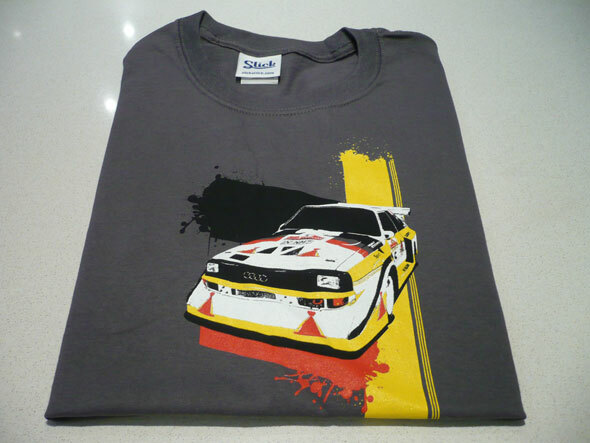 Made from 100% cotton, the t-shirt is soft and the print is durable and perfect for showing off at car shows or rallies or even just to brighten up the office. In fact, we liked it so much we had to be forced to take it off by Health & Safety. The tees are available from slickattire.com starting at £20 in various sizes and styles. Check the website for the full range. Tell them Autoblog sent you.